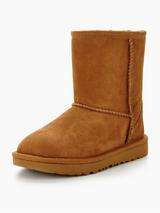 I know its Littlewoods but these are the cheapest i've seen Uggs in a long time and you can spread the cost interest free. My misses has wanted a new pair of classic short II's for a while and normally retail at £165. Various other shoes reduced too! Remember littlewoods is just Very but up the price to cover the interest which they add at point of sale and then allow you longer to pay. So these are £115 on Very. Spend another £35 for buy now pay in 12 months. Works out roughly the same time to pay but £10 less.